We open this week’s update with a health warning issued by the HSE to the stone industry, but also relevant to industries where exposure to respirable crystalline silica (RCS) can occur. Worryingly, during a recent inspection initiative in the south of England, a number of businesses were found to be unaware that in 2006 the workplace exposure limit for RCS was revised from 0.3 mg/m3 to 0.1mg/m3 thereby requiring them to devise more stringent controls. Also, with the widely reported news yesterday that Volkswagen could be facing corporate manslaughter charges over rigged diesel emission tests, we look at the Corporate Manslaughter and Corporate Homicide Act 2007, and the impact its introduction has had on companies and organisations – particularly the way in which their activities are managed and organised by senior management. And finally, we share news of the financial – and human – cost to Britain of work related injury and ill health in the year 2014/15 according to statistics released by this week by the HSE. The Health and Safety Executive is urging the stone industry to do more to protect workers’ health following findings of a recent inspection initiative in the south of England. HSE inspectors visited sixty stone businesses, including work surface manufacturers, stonemasons and monumental masons during the initiative, which ran from June to September, and was supported by trade association, Stone Federation Great Britain. The visited businesses were both Stone Federation Great Britain members and non-members. Worryingly, serious breaches were found at over half (35) of the premises that were visited. HSE issued four Prohibition Notices, 54 Improvement Notices and provided verbal advice to others. air compressors can create an explosion risk. A number of businesses were unaware that in 2006 the workplace exposure limit for RCS was revised from 0.3 mg/m3 to 0.1mg/m3 thereby requiring them to devise more stringent controls. Face masks that were inadequate. “HSE intends to visit more stone work businesses in the future to ensure that health and safety is adequately managed. Business owners should review their processes and the materials they use whilst thinking about what might cause harm and whether they are doing enough to protect workers. “Health and Safety is a top priority for the Federation and we are working closely with the HSE to improve standards in the Industry. grit and abrasive blasting, particularly on sandstone. It has been widely reported in the news this week that Volkswagen could be facing corporate manslaughter charges over rigged diesel emission tests. When the Corporate Manslaughter and Corporate Homicide Act 2007 came into force in April 2008, it was a landmark in law. For the first time, companies and organisations could be found guilty of corporate manslaughter as a result of serious management failures resulting in a gross breach of a duty of care. The Act clarifies the criminal liabilities of companies including large organisations where serious failures in the management of health and safety result in a fatality. Although the offence is not part of health and safety law, the HSE welcomed and supports the act, which has introduced an important new element in the corporate management of health and safety. Prosecutions are of the corporate body and not individuals, but the liability of directors, board members or other individuals under health and safety law or general criminal law, are unaffected. And the corporate body itself and individuals can still be prosecuted for separate health and safety offences. The Act also largely removes the Crown immunity that applied to the previous common law corporate manslaughter offence. This is consistent with Government and HSE policy to secure the eventual removal of Crown immunity for health and safety offences. The Act provides a number of specific exemptions that cover public policy decisions and the exercise of core public functions. Where can I find the Act and any guidance? When did the new Act come into force? Are there any new duties or obligations under the Act? What do companies and organisations need to do to comply? Where does health and safety legislation come in? Who will investigate and prosecute under the new offence? What is the role of health and safety regulators like HSE, local authorities etc? Will directors, board members or other individuals be prosecuted? More than a million people are being made ill by their work, costing society £14.3 billion, according to new figures published this week. Despite Britain remaining one of the safest places to work in Europe, injury and ill-health statistics released by the Health and Safety Executive show that an estimated 27.3 million working days were lost due to work related ill health or injury in 2014/15. In the same year 142 workers were killed, and there were 611,000 injuries in the workplace. The full statistical report (http://www.hse.gov.uk/statistics/overall/hssh1415.pdf) and industry specific data (http://www.hse.gov.uk/statistics/industry/index.htm) can be found online (click on the links). This is the view of HSE’s Chair Judith Hackitt: “It’s encouraging that there have been improvements in injuries and ill health caused by work related activities. But behind the statistics are people, their families, friends, work colleagues, directly affected by something that’s gone wrong, that is usually entirely preventable. Nobody should lose their life or become ill simply from doing their job. 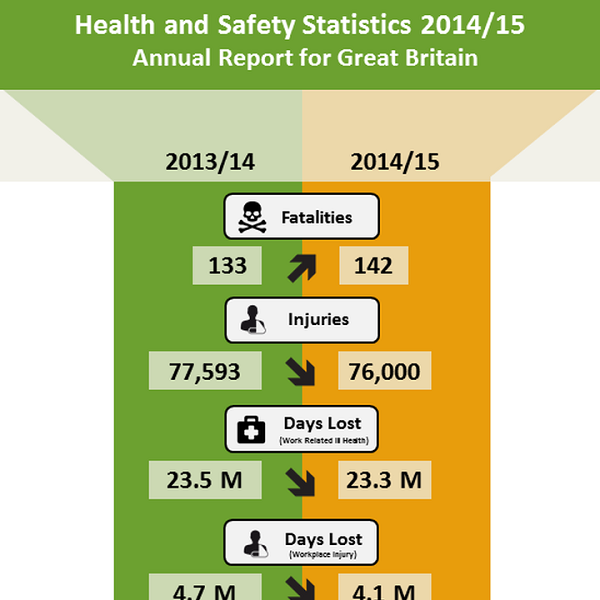 These figures show that despite the great strides and improvements made over the last 40 years since Britain’s health and safety regime was established, there is still more that can be done”. Click image to open full version (via Bryan Armstrong Ltd).